Sunset Overdrive is in every way an oddity. It's an open-world game about monsters taking over a city that has since been quarantined — a la Raccoon City, except bright and happy — in which you will grind around on everything, as if you were riding a skateboard in a Tony Hawk game, shooting monsters and other varieties of baddies while helping out other survivors of this localized apocalypse. 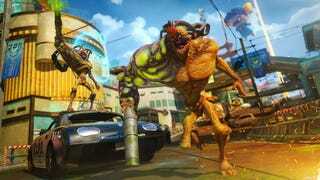 Where Sunset Overdrive stands out, though, is in how it brings its weird weapons and weird player movements together. When I talk about grinding and bouncing it's not as some novel, optional activity; you're supposed to do those things all the time. If you aren't grinding or bouncing or ziplining it's almost always because you made a mistake. These actions are collectively referred to by the game as "traversals," and successfully maneuvering from one traversal to another without moving around like a normal person would up the damage multiplier. Sunset Overdrive is a fantasy, one that lets you cut loose and be what you want. That core philosophy extends to character customization, which is Saints Row-esque in its lack of restrictions. You can play as a woman or a bro, and regardless of that choice you're able to roll in any of the clothing or hairstyles or any other things you can do to your character because there are no gender-specific options. You get to cut loose, just like it seems Insomniac is itself cutting loose. "I can point to many, many things in our history that we tried, and didn't work as well as we thought," Insomniac CEO and president Ted Price said to me, though he later straight up declared he isn't worried at all about that happening with Sunset Overdrive. "We're building a game that's different. We're building a game that is not a dark, gritty shooter. This is a game that isn't what's become the expected view of the apocalypse. This a game where we're having fun. This is a game where we're asking players to join us on a very different vibe."